The identification of a core spatial pattern of white matter pathology in amyotrophic lateral sclerosis (ALS) is essential for the development of MRI-based diagnostic protocols. However, the description of disease-defining white matter changes is confounded by the genetic, neuropsychological and clinical heterogeneity of ALS. Over 50 diffusion tensor imaging (DTI) papers have been published in ALS to date, and while corticospinal tract and corpus callosum involvement is invariably highlighted, DTI studies are conflicting regarding the degree of extramotor and cerebellar white matter degeneration. Nonetheless, there is an evolving recognition that motor disability in ALS is complicated by extrapyramidal dysfunction1 and cerebellar involvement.2 The notion, that cerebellar pathology may contribute to non-motor manifestations, such as impairments in language, attention and social cognition, is also increasingly recognised.3 Recently, cerebellar changes in ALS and frontotemporal lobar degeneration (FTLD) have been specifically linked with the C9orf72 hexanucleotide repeat expansion,4 raising the question whether cerebellar degeneration is an important feature of C9orf72 negative ALS. In order to evaluate cerebellar white matter involvement in ALS, a comprehensive DTI study has been carried out with 42 healthy controls, 27 cognitively intact C9orf72 negative patients with ALS, and nine patients with ALS carrying the C9orf72 hexanucleotide expansion. All patients tested negative for a panel of other gene mutations implicated in ALS, including FUS, SOD1, TARDBP, ANG, VAPB, VCP, OPTN, SETX and ALS2. All three study groups were matched for age and patient groups were matched for disease duration: C9orf72 negative ALS group (n=27, mean age 59.7 (SD 10.6), gender 13M/14F, mean disease duration 26.7 (SD 23) months), C9orf72 positive ALS group (n=9, mean age 54.1 (SD 10.42), gender 7M/2F, mean disease duration 27.5 (SD 10.1) months), healthy controls (n=42, mean age 59.6 (SD 9.46), gender 22M/20F). All participants provided informed consent in accordance to the Medical Ethics Approval of the research project (Beaumont Hospital, Dublin, Ireland). Participating patients with ALS had probable or definite ALS according to the El Escorial criteria. All patients underwent detailed neuropsychological assessment, testing domains of executive function, language, behaviour, memory, phonemic and semantic fluency, and visuospatial function. MR data were acquired on a 3 T Philips Achieva system with gradient strength 80 mT/m and slew rate 200 T/m/s using an eight-channel receive-only head coil. DTI were acquired using a spin-echo planar imaging (SE-EPI) sequence with a 32-direction Stejskal-Tanner diffusion encoding scheme: field of vision (FOV)=245×245×150 mm, spatial resolution=2.5 mm3, 60 slices with no interslice gap, repetition time (TR)/echo time (TE)=7639/59 ms, SENSE factor=2.5, b values=0, 1100 s/mm2, with spectral presaturation with inversion recovery (SPIR) fat suppression and dynamic stabilisation and an acquisition time of 5 min 41 s. Subsequent to Eddy current corrections and brain extraction, fractional anisotropy (FA), axial diffusivity (AD), mean diffusivity (MD) and radial diffusivity (RD) images were created by fitting a tensor model to the raw diffusion data. All participant's data were then aligned into a common space by non-linear registration using the Tract-Based Spatial Statistics (TBSS) module of the FSL image analysis suite. Following the non-linear registration and skeletonisation, each participant’s FA, MD, RD and AD image was merged into a single four-dimensional image file and a mean FA mask was created. Permutation-based nonparametric inference was used for the voxelwise comparison of diffusion parameters between the study groups controlling for age and gender, and applying the threshold-free cluster enhancement (TFCE) method. Additionally, comparisons of C9orf72 negative and positive patients were corrected for disease duration. For the region-of-interest (ROI) analyses, a skeletonised cerebellar white matter mask was created based on the study-specific mean FA skeleton, which was masked by the cerebellar map of the Montreal Neurological Institute (MNI) probability atlas, thresholded at 50%. Cerebellar ROI-based analyses were carried out within this white matter mask. Similarly to previous studies,5 the whole-brain analyses demonstrated that the white matter regions that are primarily affected in C9orf72 negative ALS compared with controls include the corticospinal tracts, the bilateral white matter subjacent to the primary motor cortices and the body of the corpus callosum. These changes were significant at p<0.01 following TFCE corrections for FA and RD and at p<0.05 for MD accounting for age and gender. However, at the less stringent statistical threshold of p<0.05, FA and RD also captured diffusivity differences in the cerebellum, brain stem, occipital lobes, opercular and insular regions. Using the cerebellar white matter mask for ROI analyses, bilateral, symmetrical cerebellar white matter pathology was captured based on axial, radial and MD values in the C9orf72 negative cohort (figure 1). Moreover, C9orf72 positive patients demonstrated multiple cerebellar white matter regions with decreased axial, mean and RD compared with C9orf72 negative patients. Our study confirmed a core ALS white matter signature; incorporating the corpus callosum, corticospinal tracts and the precentral gyrus white matter and highlighted additional cerebellar, brain stem and occipital white matter changes. The key finding of our study is that a relatively homogeneous cohort of patients with ALS , with no evidence of cognitive impairment, who tested negative for a comprehensive panel of ALS causing mutations, demonstrated extensive cerebellar white matter pathology in vivo. 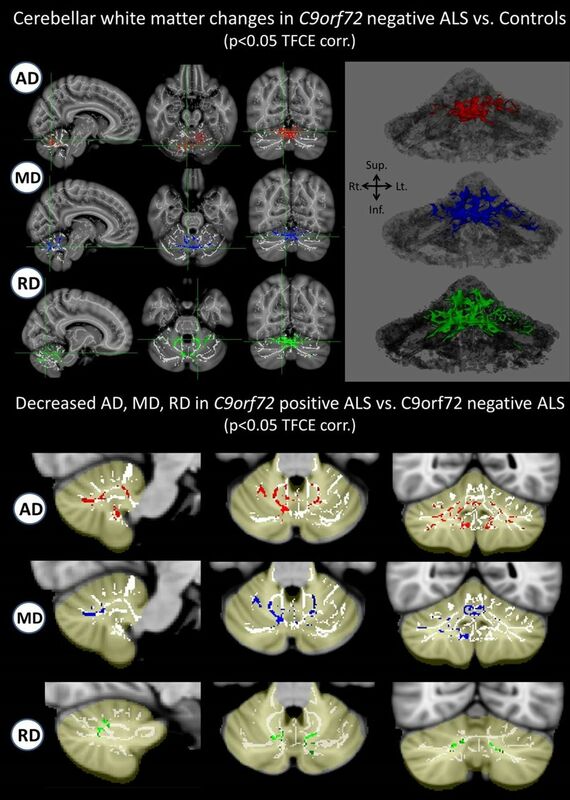 While cerebellar white matter degeneration in ALS is likely to contribute to the heterogeneous motor and neuropsychological deficits observed clinically, relatively little specific attention has been paid to cerebellar changes in ALS imaging studies to date. Pathology studies have focused primarily on cerebellar changes in association with the C9orf72 hexanucleotide repeat expansion4; whereas our results indicate that cerebellar changes also occur in those with no known pathogenic genetic variants. The main methodological limitation of the study is using tract-based spatial statistics alone, which is an excellent tool to explore voxelwise changes in white matter integrity, but provides limited information on alterations in corticocortical and corticobasal connectivity. Therefore, additional studies combining skeleton-based methods, tractography, connectomic mapping and functional techniques are required to comprehensively characterise the full spectrum of cerebellar degeneration in ALS and its clinical manifestations.
. Extrapyramidal stiffness in patients with amyotrophic lateral sclerosis. Mov Disord 2009;24:2143–8.
. The involvement of the cerebellum in amyotrophic lateral sclerosis. Amyotroph Lateral Scler Frontotemporal Degener 2013;14:507–15.
. The cerebellum and cognitive function: 25 years of insight from anatomy and neuroimaging. Neuron 2013;80:807–15.
. The neuropathology associated with repeat expansions in the C9ORF72 gene. Acta Neuropathol 2014;127: 347–57.
. Multiparametric MRI study of ALS stratified for the C9orf72 genotype. Neurology 2013;81:361–9. Contributors PB and OH were involved in the conceptualisation and design of the study and drafting of the manuscript. PB was involved in the acquisition and analysis of MRI data. ME, SB, RLM, KK, AV and DGB were involved in the clinical, genetic and neuropsychological characterisation of participating patients. AF contributed to the optimisation of MRI protocols and pulse sequences. Statistical analysis was conducted by PB. Funding This work was supported by the Elan Fellowship in Neurodegeneration, the Health Research Board (HRB—Ireland, grant number HPF/2009/17) and the Research Motor Neuron (RMN-Ireland) foundation. OH's research group has also received funding from the European Community's Seventh Framework Programme (FP7/2007-2013) under grant agreement n  (EUROMOTOR), the EU-Joint Programme for Neurodegeneration (JPND) SOPHIA project and an unrestricted research grant from Elan Pharmaceuticals. Competing interests OH has received speaking honoraria from Janssen Cilag, Biogen Idec, Sanofi Aventis and Merck-Serono; she has been a member of advisory panels for Biogen Idec, Allergen, Cytokinetics, Ono Pharmaceuticals and Sanofi Aventis. Ethics approval The presented study has been approved by the Ethics (Medical Research) Committee of Beaumont Hospital, Dublin, Ireland. Data sharing statement The corresponding author (PB) had full access to all the data in the study and takes responsibility for the integrity of the data and the accuracy of the data analysis.